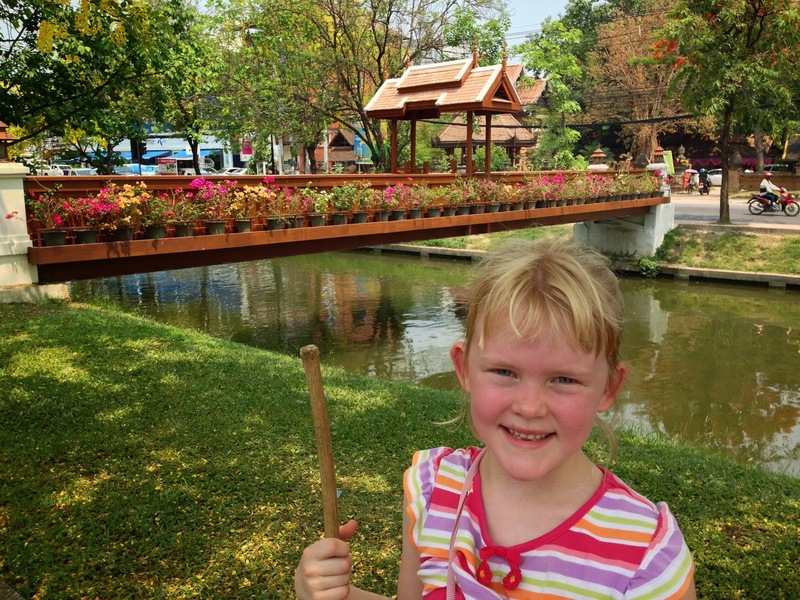 The first stop on our recent trip to Thailand, was the beautiful northern city of Chiang Mai. 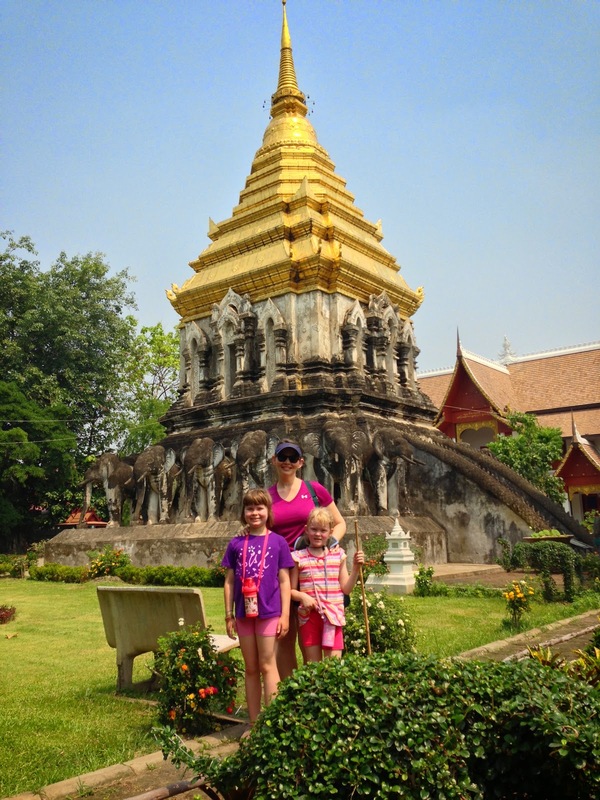 Known for elephants, wonderful food, and beautiful temples, Chiang Mai did not disappoint! 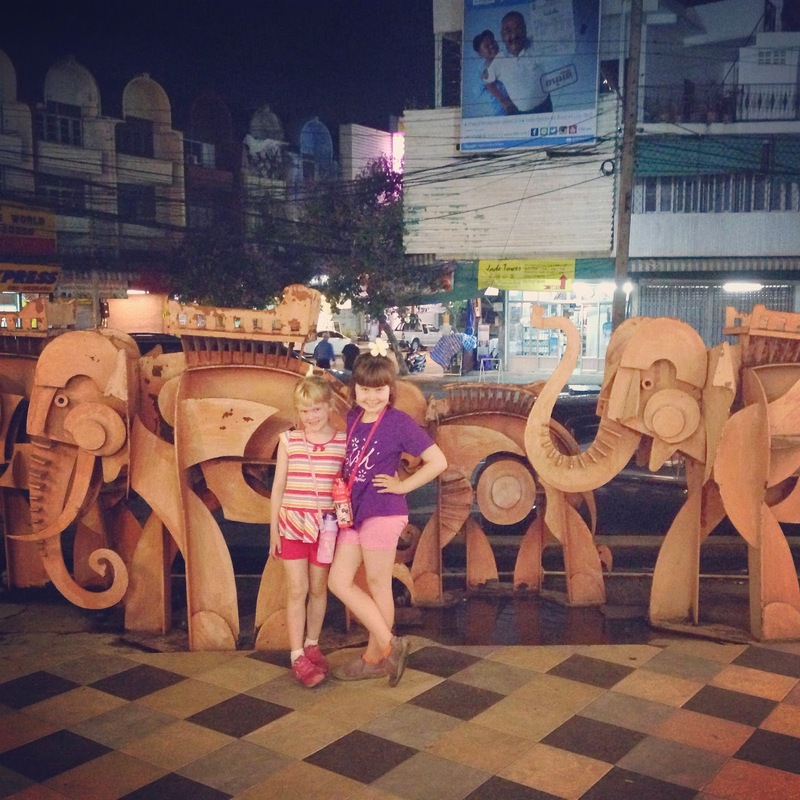 We spent our first day wandering around the city. 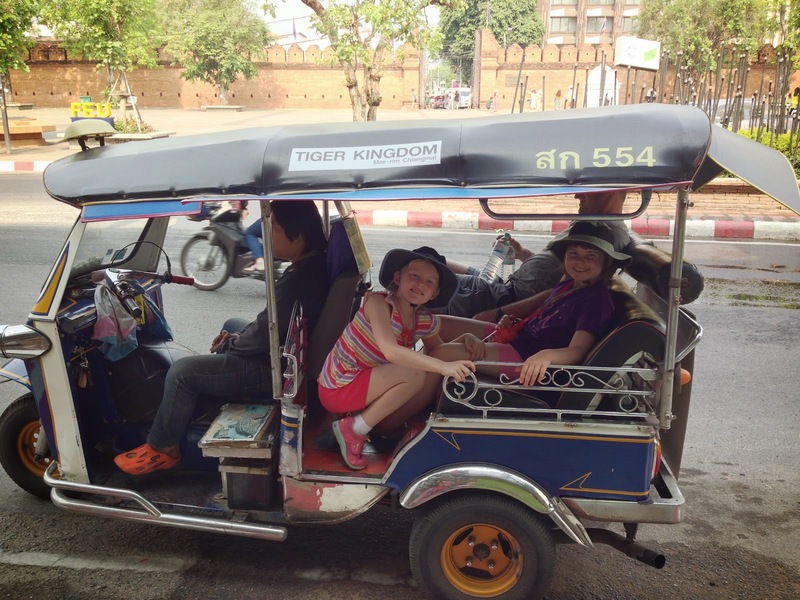 Tuk tuk is our favorite form of transportation in Thailand. We all pile in and away we go. 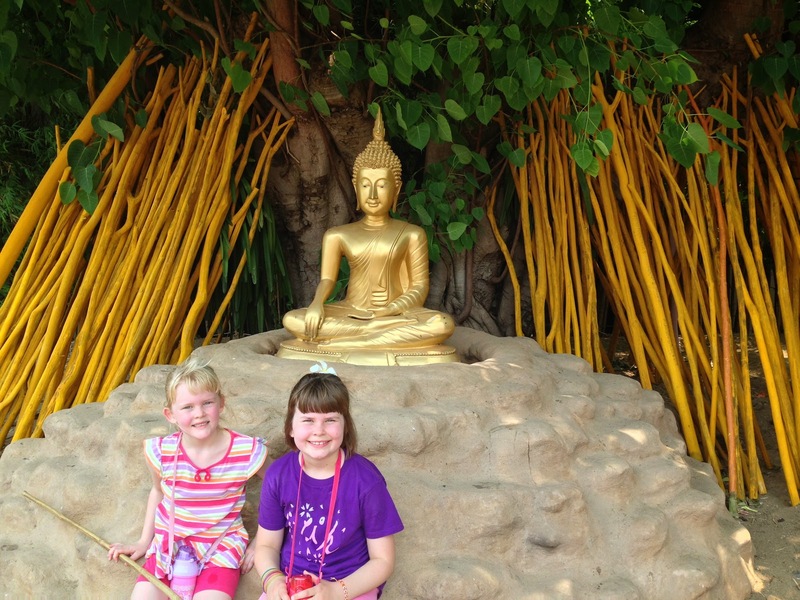 The girls find this very adventurous! 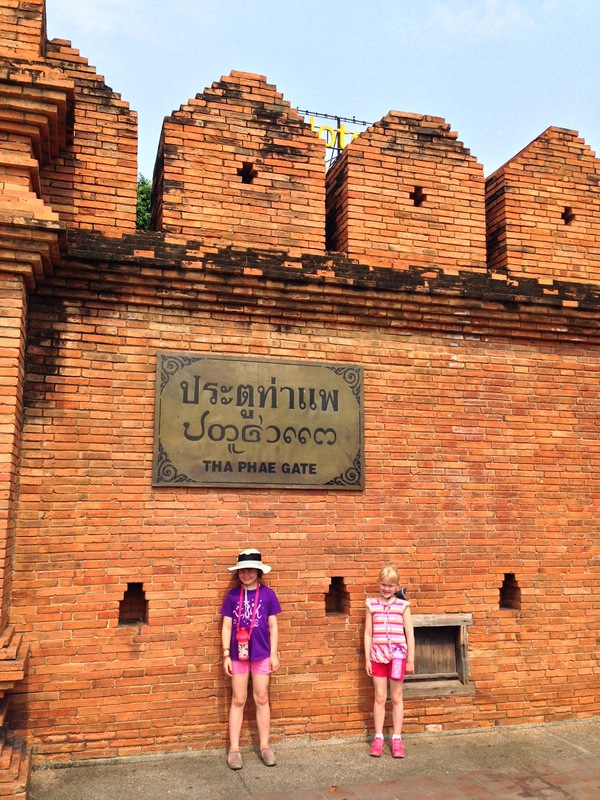 Chiang Mai, founded in 1296, literally means”the walled city”. 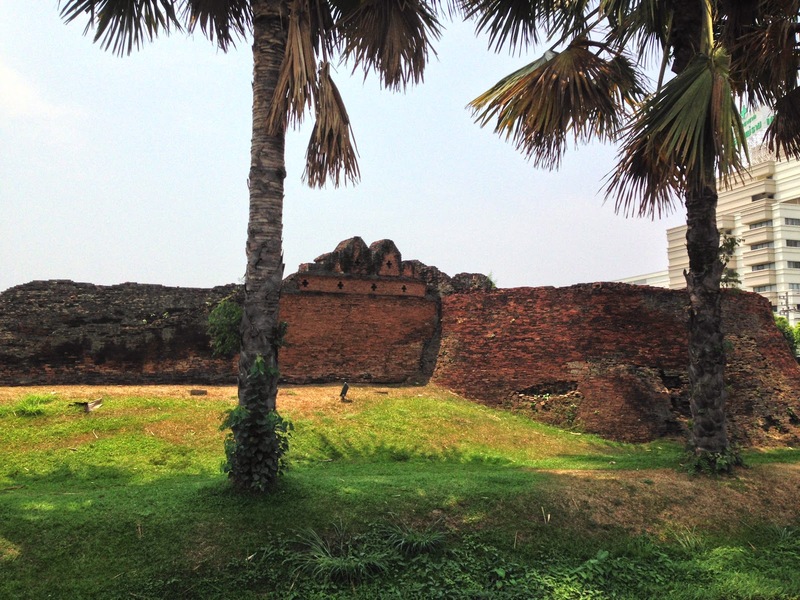 Part of this wall is still standing and marks the old town area. More of the original wall. 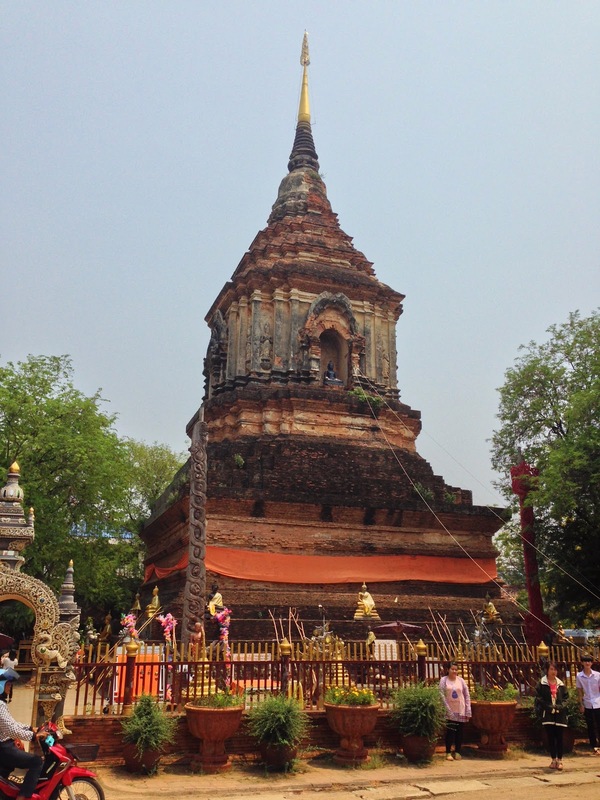 There are over 30 temples in Chiang Mai old town, alone, and I think we saw just about all of them! 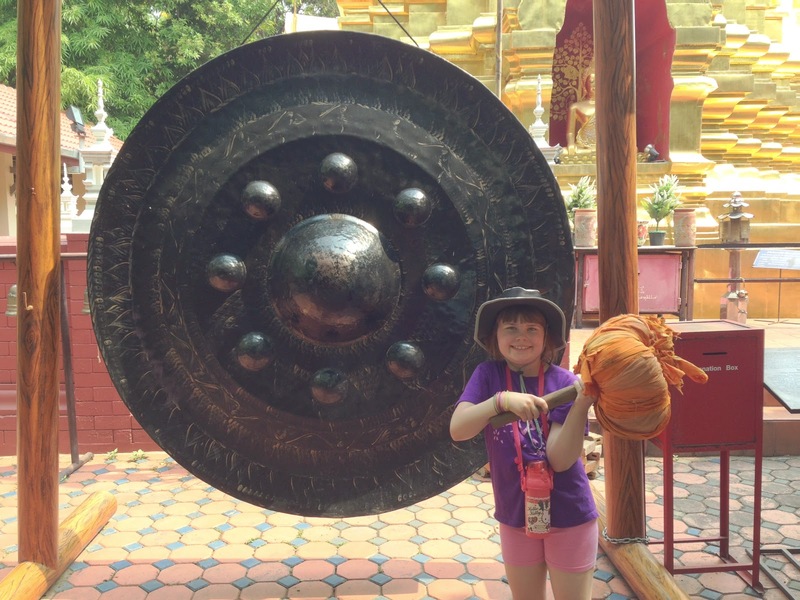 The girls were able to take a swing at this gong. The mallet was heavy! 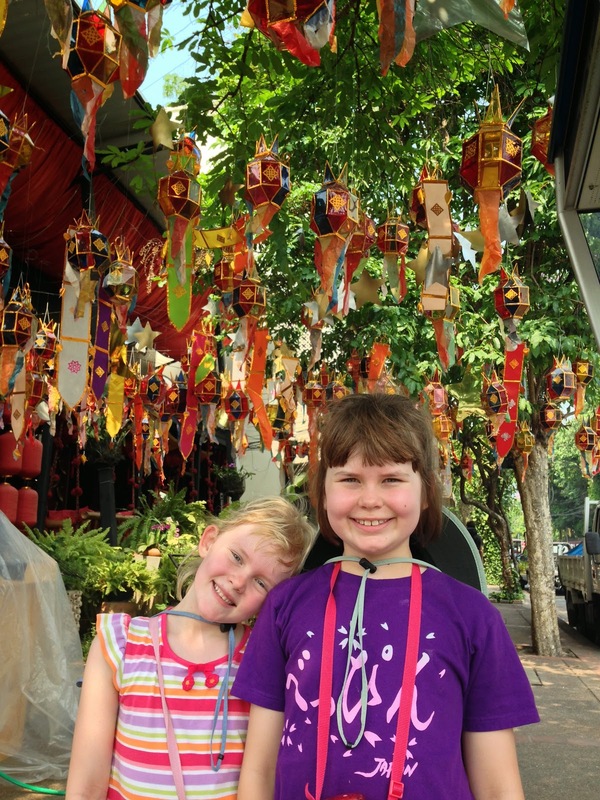 We loved the colorful lanterns hanging outside this restaurant. 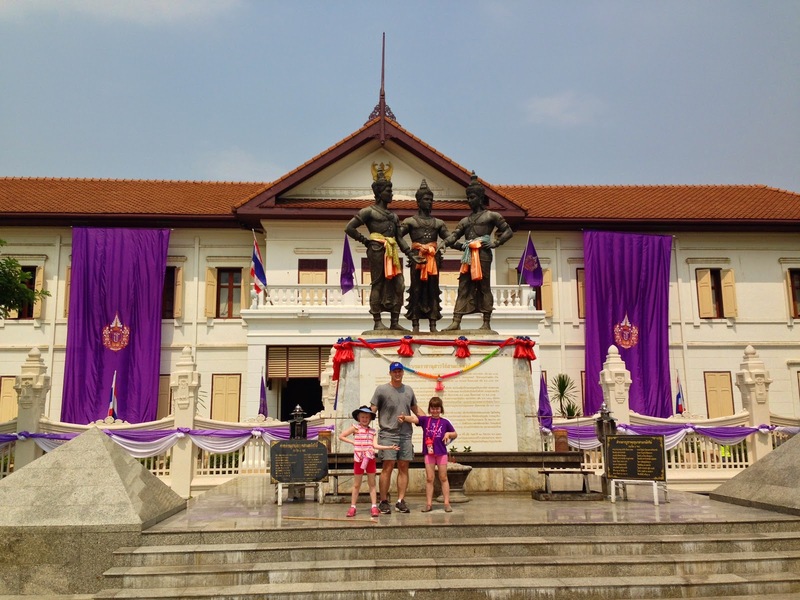 This was the Three Kings Monument, a famous statue of the founders of Chiang Mai. The clothes reminded me of wonderful musical, The King and I, and the great Yul Brynner. 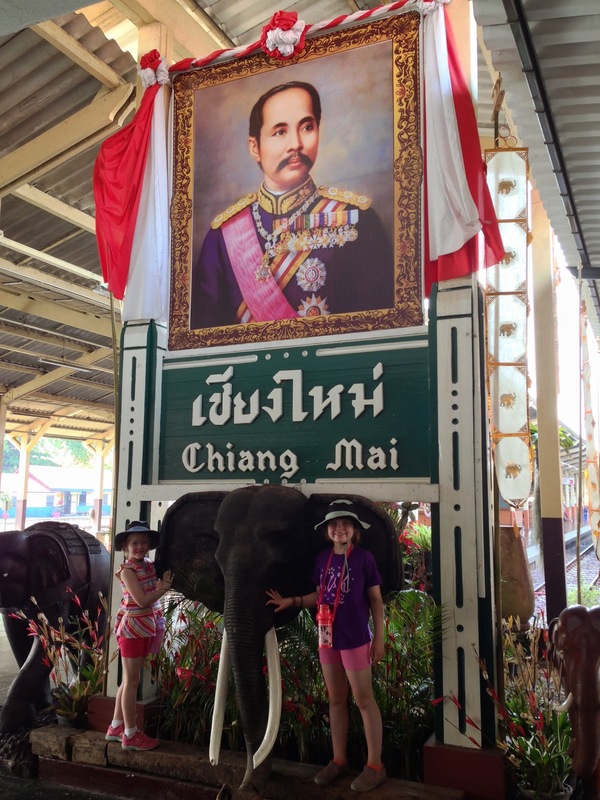 (Thailand was formerly known as Siam). 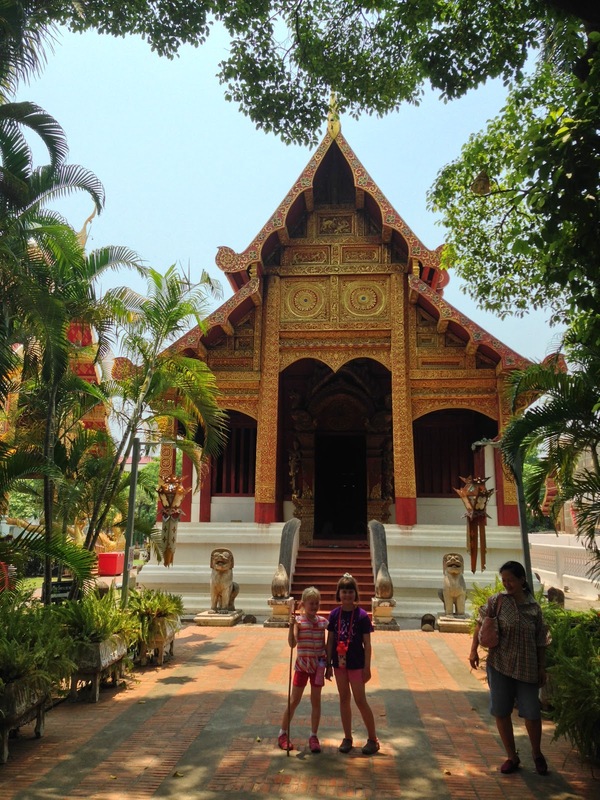 Wat Chiang Man, is the oldest surviving temple, and I really loved this one. 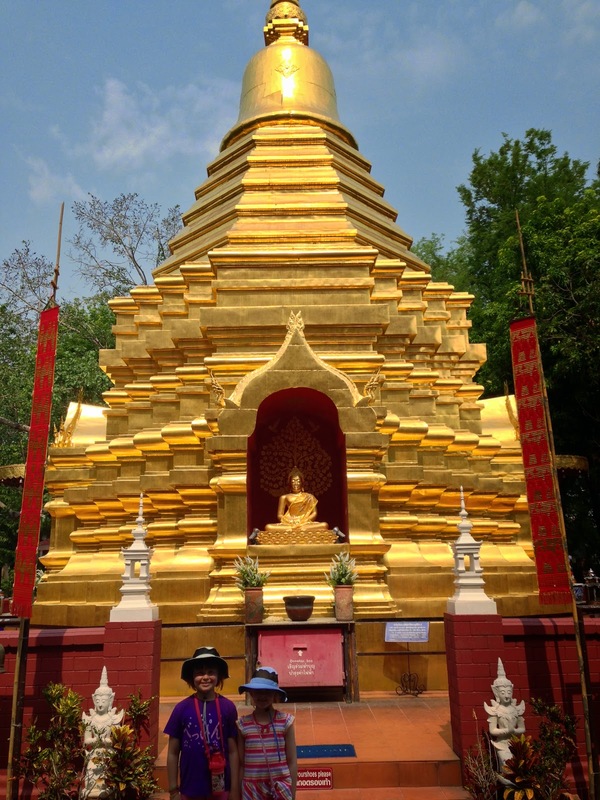 I can’t believe that this temple was built in 1297, and is still standing. That’s old! 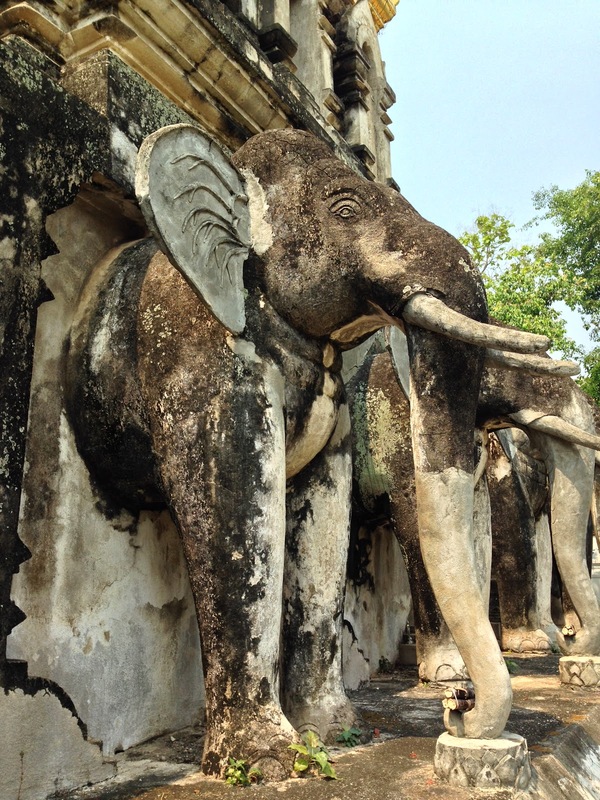 These elephants carved in stone were amazing. 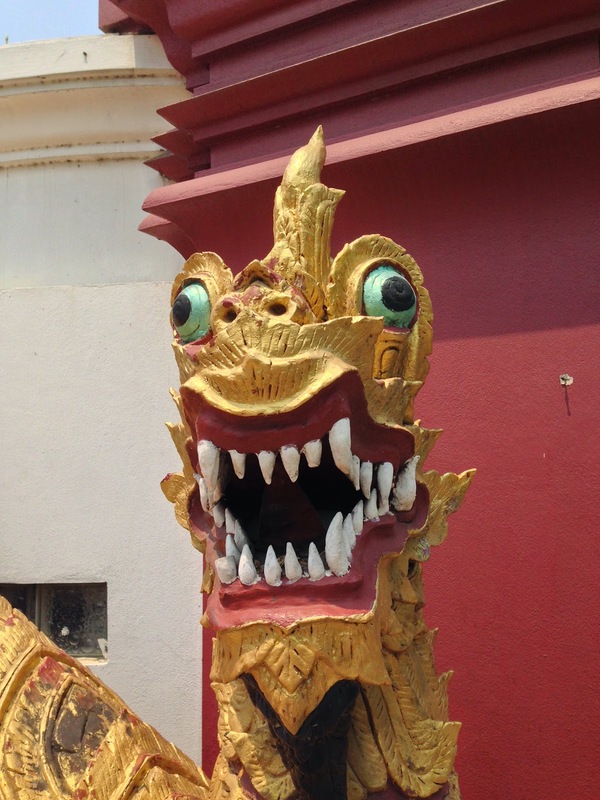 Lots of detail in the dragons, too. I always know the heat and humidity level, by looking at Matt’s shirt. It was HOT! But, there was a lovely breeze blowing as we walked along this canal. Ahhhh, nice. 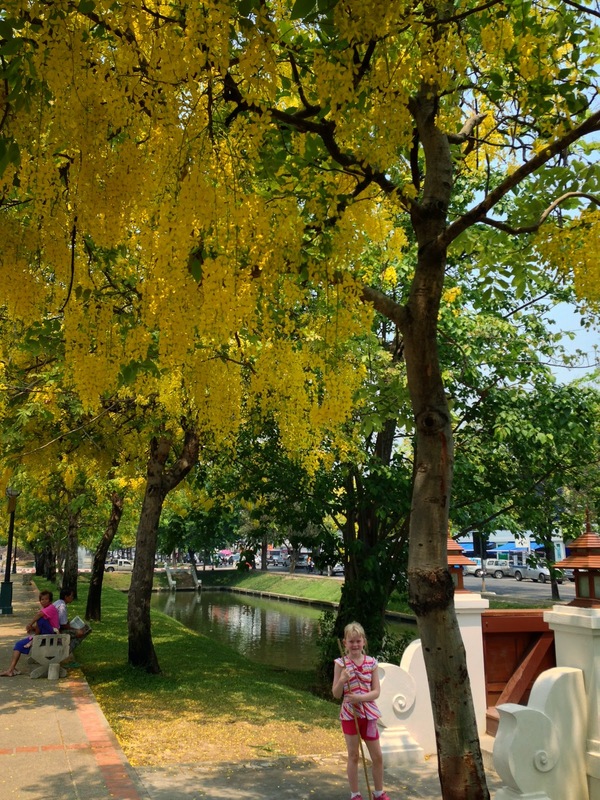 I loved these beautiful flowering trees, too. The bright yellow flowers were gorgeous. 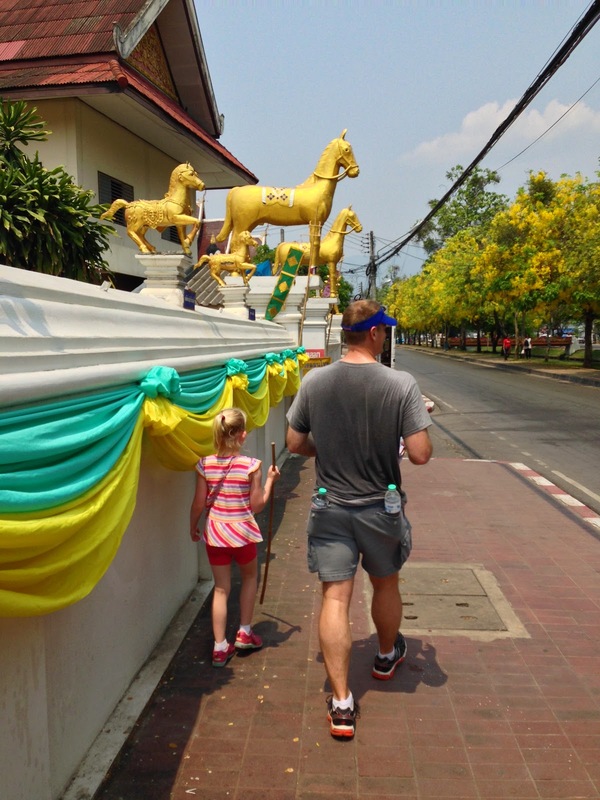 I hate to say it, but living in Asia for the past two years, has completely desensitized us to shrines and temples. 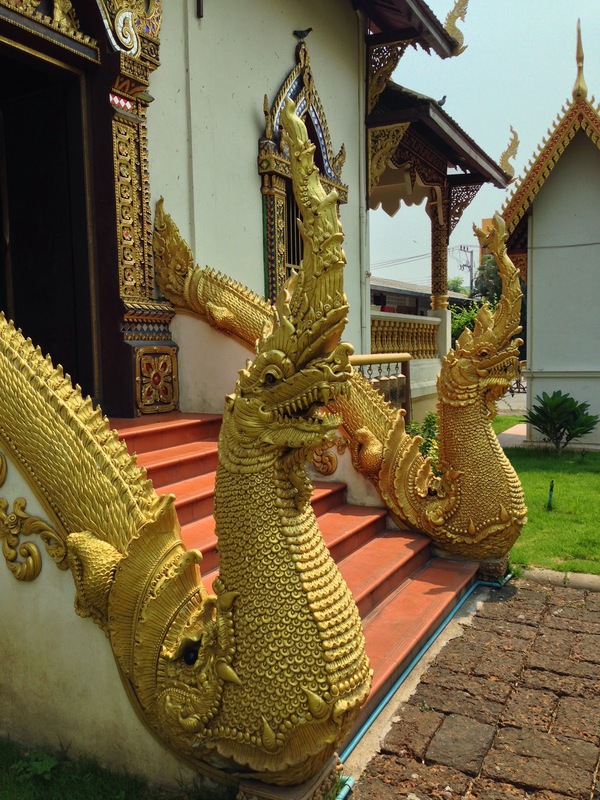 We say, “Look, it’s another shrine”, which is sad because they are absolutely exquisite! 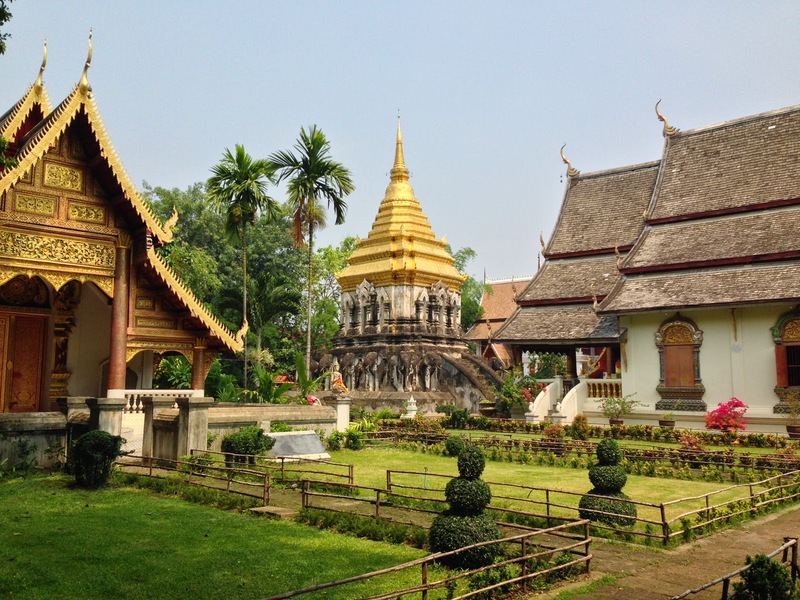 This temple, Wat Chedi Luang, was especially cool, though. 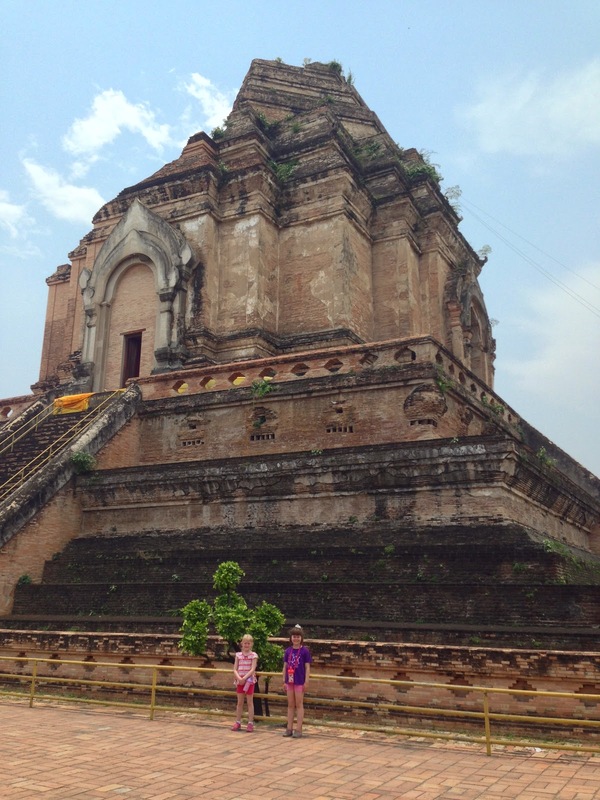 Built in the 14th century, it looked more like ruins, and just like something out of Indiana Jones. 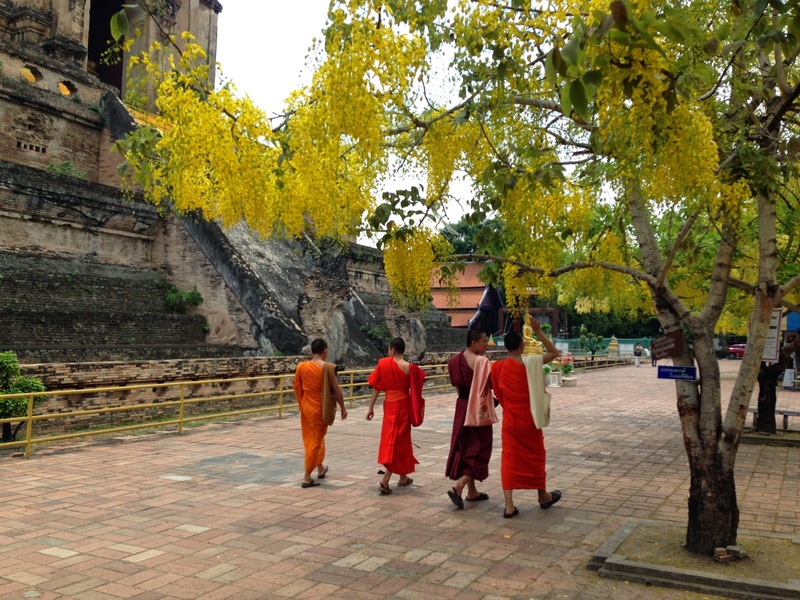 There were lots of monks roaming around, too. 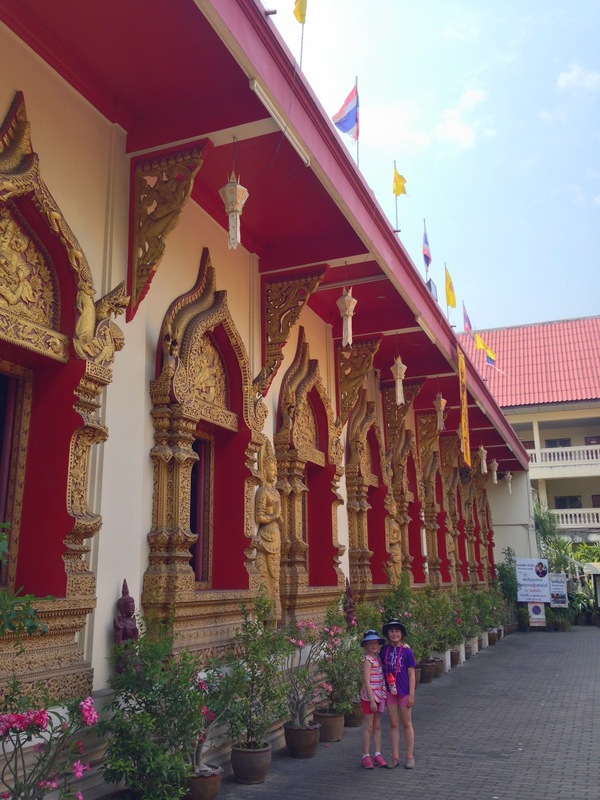 Ladies are not allowed to wear shorts or tank tops at these temples and must cover up with a sarong to maintain a level of modesty. 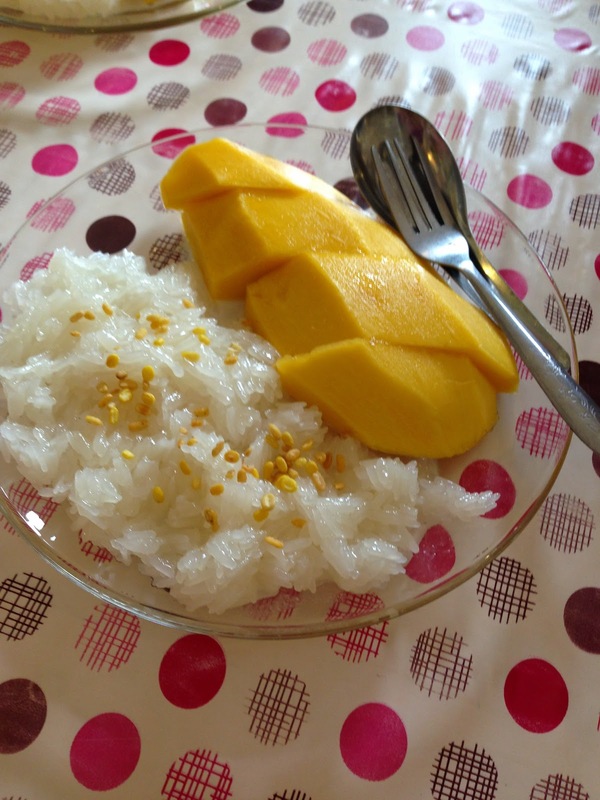 After lots of roaming and lots of temples, we decided it was time for one of our favorite Thai treats. 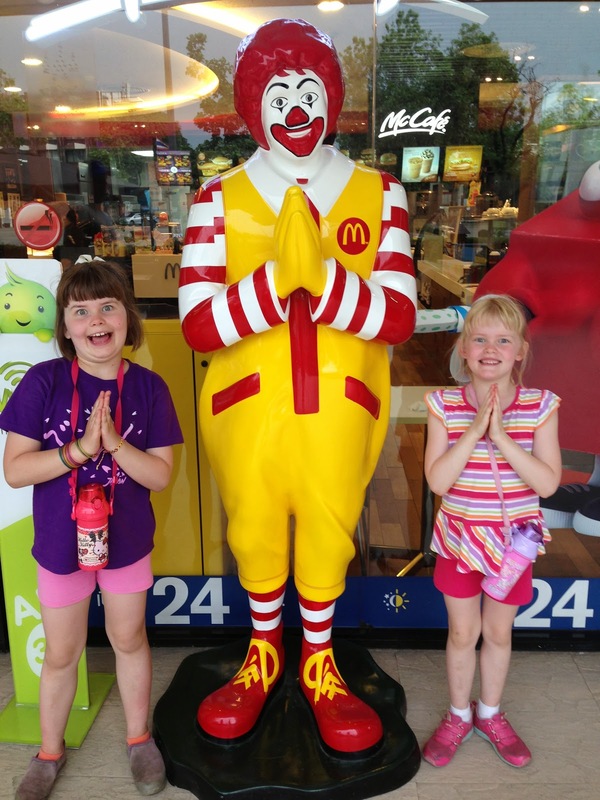 Apparently, this Ronald McDonald is a popular Chiang Mai photo op. 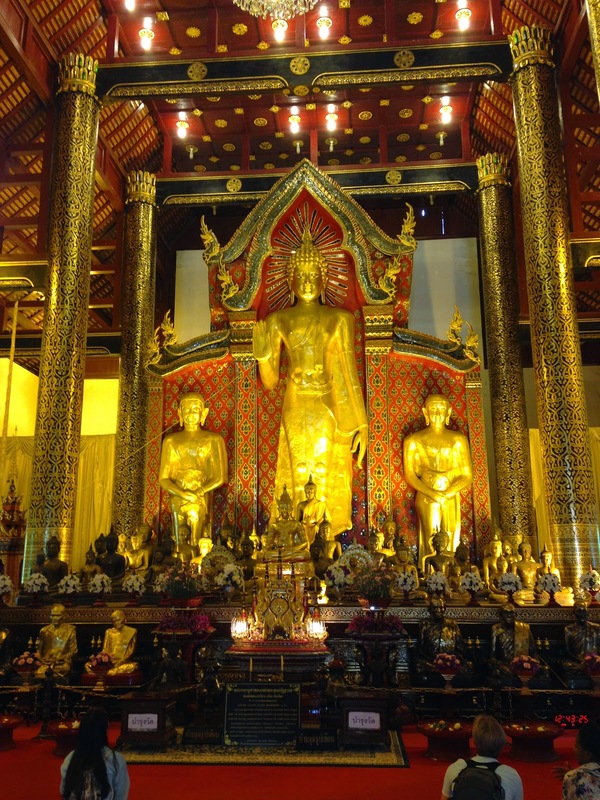 He is giving the Thai hand gesture of thank you, or hello/goodbye. 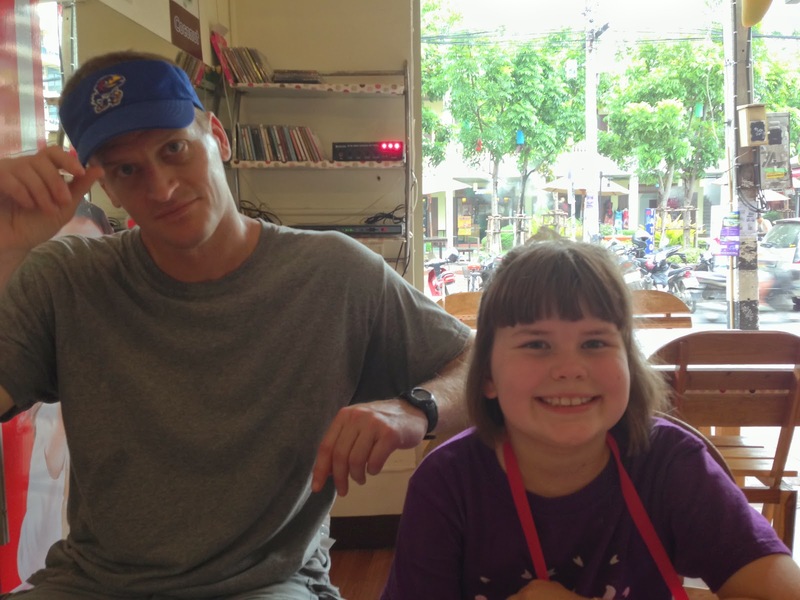 After a long day exploring, I decided it was time to get a Thai massage. Massage parlors are all over the place and are SO cheap. 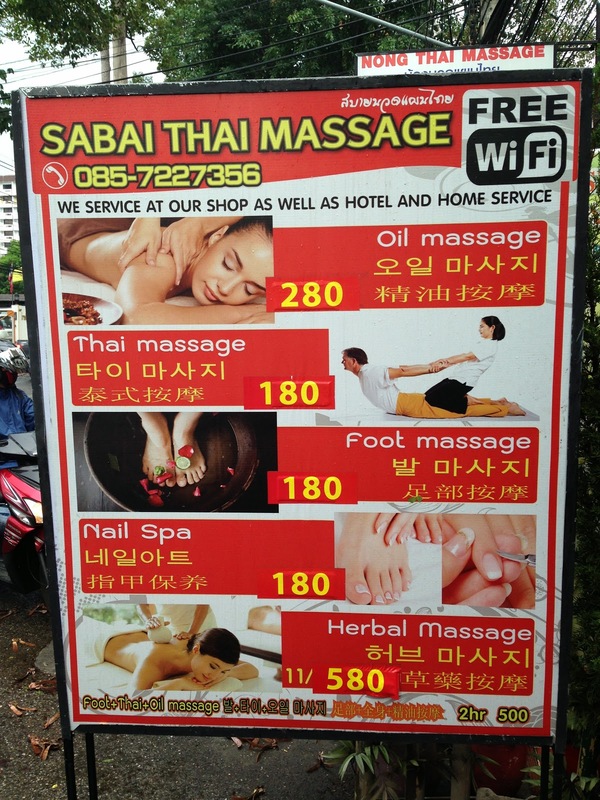 I got a one hour massage for 180 Baht, about $6! 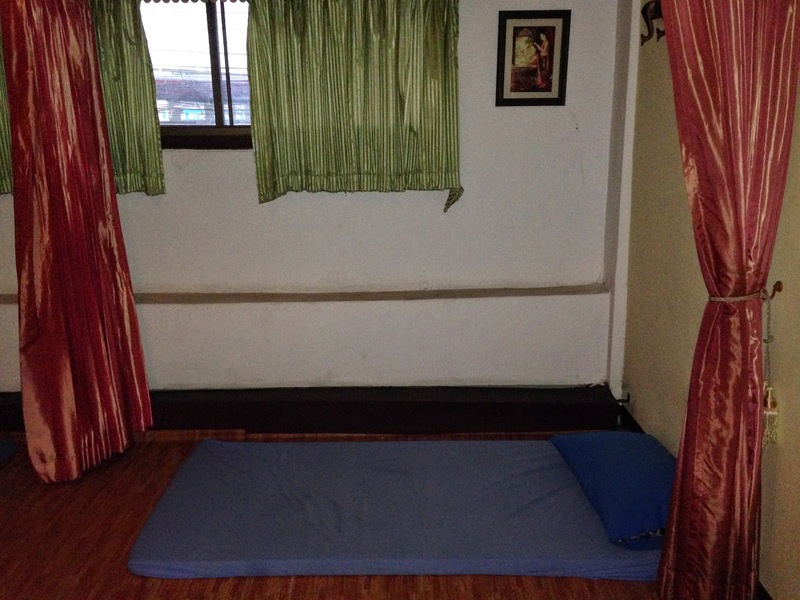 Thai massage is very interesting. You change into light weight cotton clothes, like pajamas, then lay on a little mat on the floor. The masseuse uses all sorts of stretching and pressure point techniques. I wouldn’t call it relaxing as much as therapeutic. Yes, she even stood on my behind. Funny. My favorite part was listening to a tropical rainstorm outside, and feeling the cool, fresh air blow in through the open window. So refreshing! 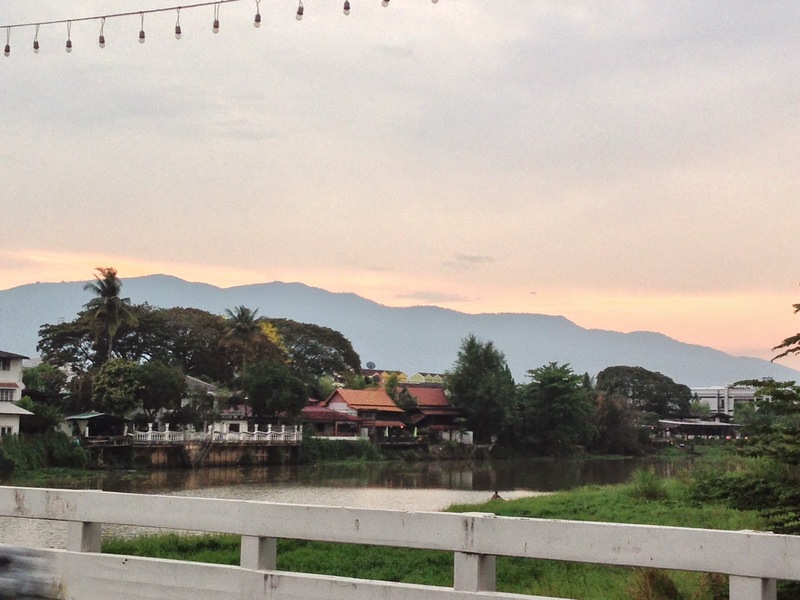 The beautiful mountains of Chiang Mai at dusk. 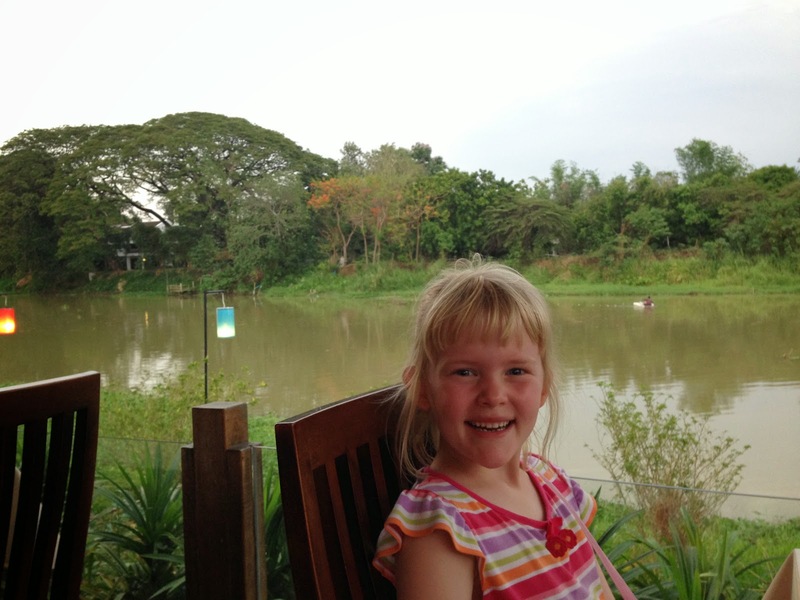 We walked to a small restaurant for dinner, with a patio overlooking the Ping River. The food was spectacular! 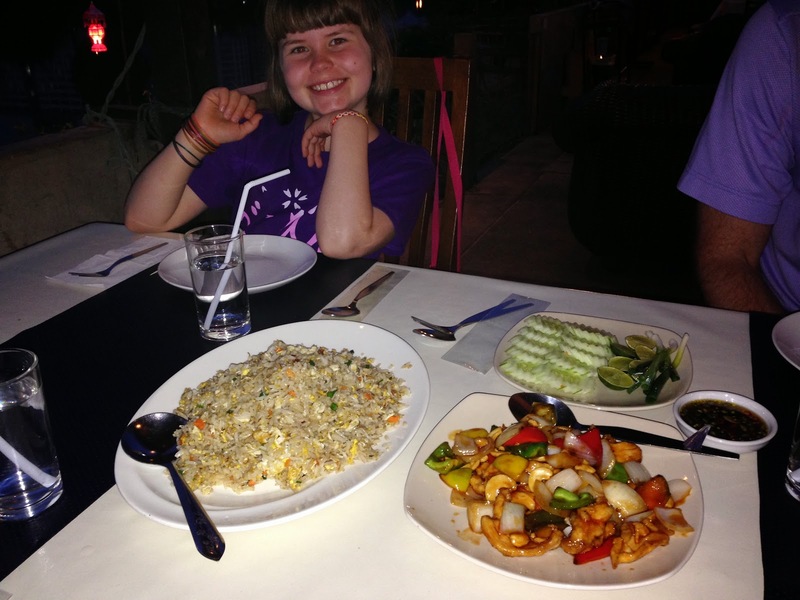 We had cashew chicken, fried rice and massaman curry. I want to go back! 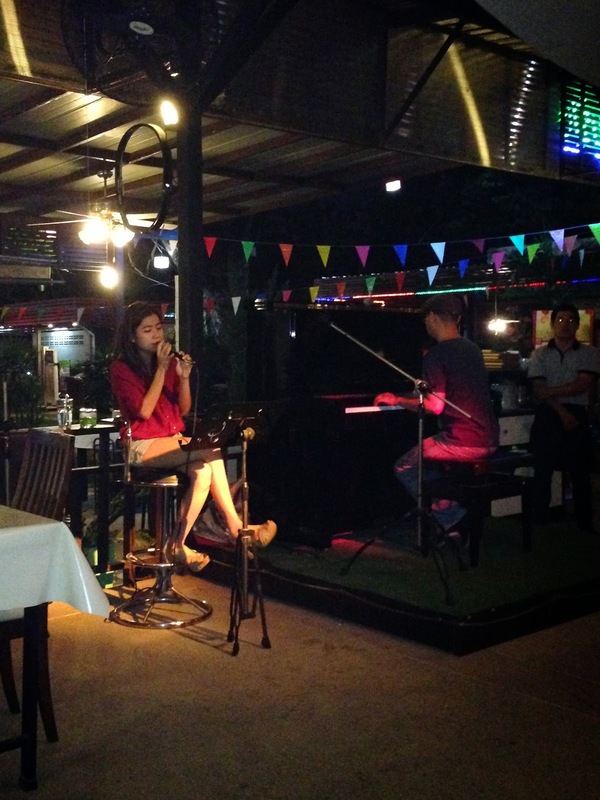 There was also live entertainment. The repertoire was very Carpenter’s heavy, but who doesn’t love singing along to “Top of the World”? I loved it! 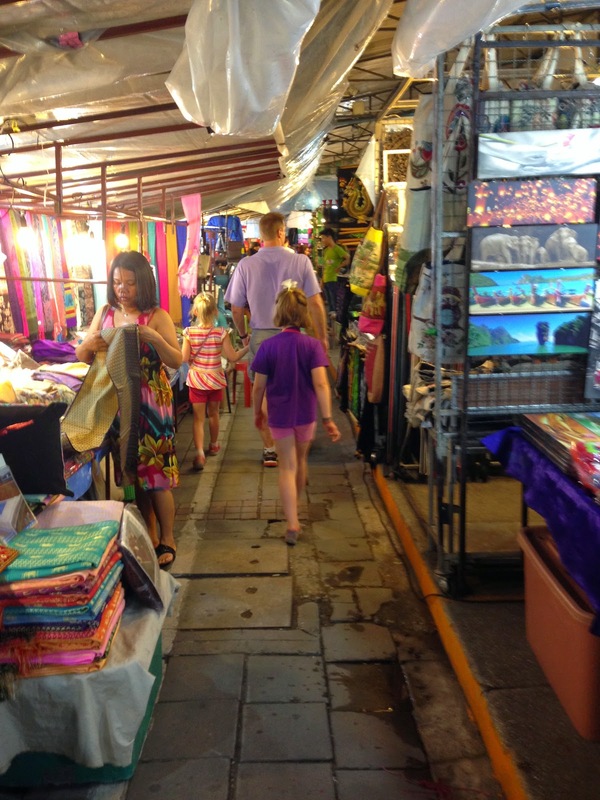 After a quick trip through the night market, we called it a day. Previous Post My big, fat, cherry blossom blog! 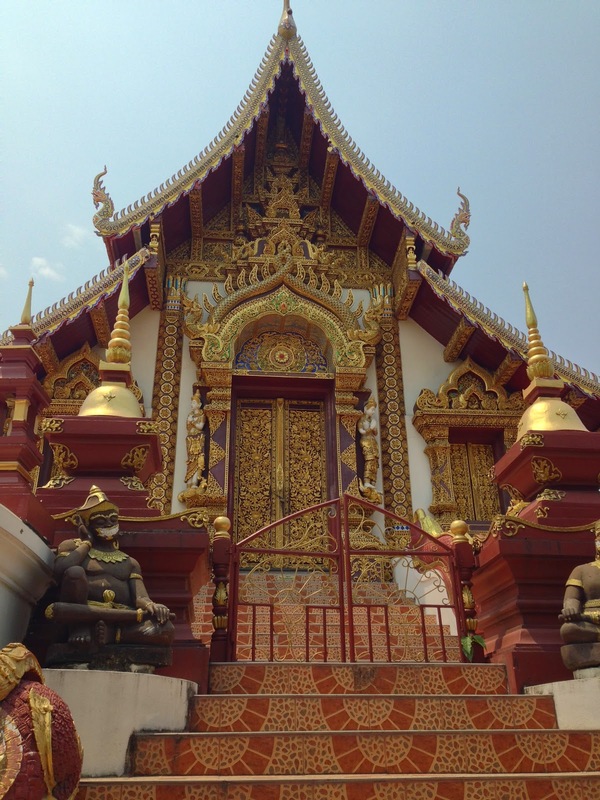 It is almost overwhelming to take in so much color and detail at so many temples/shrines. I see what you mean! Lovely though. I could look at these pictures all day. I agree with Amara. What a wonderful world tour you are giving us.